Violence, brutality and unlawful treatment by authorities are frequent according to the 140 people interviewed. PEOPLE FLEEING WAR, persecution and poverty describe beatings, robbery and inhumane treatment at the hands of police, border guards and other officials, in a new report published by NGOs. The report A Dangerous ‘Game’ is based on 140 interviews with refugees and migrants that are using the Western Balkan route to reach Europe. All 140 people interviewed said they suffered mistreatment by officials. It exposes a disturbing pattern of brutality and abuse by law enforcement officials against migrants, including children. Accounts of abuses include reports of border police in Croatia forcing migrants to strip and walk back over the border to Serbia, while running a gauntlet of officers who beat them back with batons. Another described how Bulgarian police search groups of migrants and take all of their valuables, even their shoes, before sending them back over the border. One of the interviewees, Isaaq from Afghanistan, described his treatment in Bulgaria. They put us in a cage and didn’t give us food for three days. They beat us so badly. They even gave us electric shocks. The report details an account of Hungarian officials forcing migrants to take off their clothes and sit in snow as they poured cold water over them. Jim Clarken, Oxfam Ireland’s Chief Executive said, “The testimonies we have collected expose the horrendous treatment governments, including those of European Union member states, are condoning in order to stop people entering their territory. These people are fleeing unimaginable situations in their home countries – violence, persecution, disaster and poverty – and for them to be met with brutality and worse here in Europe is shocking and unjust. 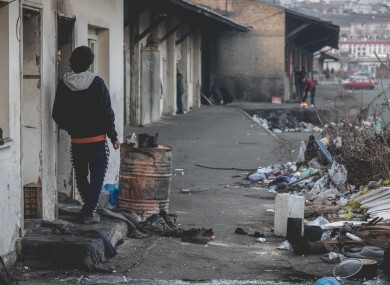 Nikolina Milić of the Belgrade Centre for Human Rights said, “These cruel and unlawful actions do nothing to stop the journey of people seeking safety and dignity. People tell us they have nothing to lose and will try to continue however dangerous it may be. These accounts echo UNHCR findings that people are regularly being informally expelled from one territory to another across the region. In Serbia one group of migrants, including a two-year old child, were told that they were being taken to a refugee reception centre. Instead, police brought them to a forest on the Bulgarian border in the middle of the night in freezing temperatures and left them there. The group survived, but by the time they were found two of them had lost consciousness due to hypothermia. Clarken added, “The inhumane and illegal actions of law enforcement officials is fuelling fear in refugees and migrants, forcing many of them to rely on smugglers to continue their journey, a dangerous risk which exposes them to exploitation and abuse. This reinforces the need for EU leaders to provide safe and legal pathways to Europe. The Irish Government must also play its part by honouring its relocation commitments under the Irish Refugee Protection Programme, which have been unforgivably delayed. The testimonies in this report were collected from 30 January to 17 February 2017 in Serbia and Former Yugoslav Republic of Macedonia. The vast majority of the interviewees came from Afghanistan, the others from Pakistan, Syria, Iraq, Iran, Egypt and Lebanon. The names in the report have been changed to protect the identity of the people we have spoken to. Email “European police forcing migrants to strip and walk back over border according to NGO report”. Feedback on “European police forcing migrants to strip and walk back over border according to NGO report”.